Oscar nomination morning comes with its share of surprises and disappointments. We can argue endlessly on the merits (or lack thereof) of the nominees and the snubbed. But it also brings a certain amount of the absurd: the sort of things that, regardless of personal opinion, just don’t make sense. That’s what I want to briefly talk about today. Three weeks after nominations and I still don’t get these. Thankfully this has gotten lots of press. This was a fairly good year for movie songs. I didn’t do my once-annual song roundup this year though not due to a lack of compelling options like last year, but just a lack of time. In the mix of fun Muppets ditties, above-average animated tunes, and compelling fade-to-black melodies from the likes of The National and Chris Cornell that appropriately encapsulate a film’s atmosphere, there were several good options. Instead, the music branch nominated just two songs. The nomination process was tweaked two years ago. Branch members see clips of all the qualified songs as they appear in their movies then rate each on a 6-10 numeric scale. Only songs that receive an 8.25 average or above may be nominated. The result is the number of songs can fluctuate each year. The fact that the branch felt fit to nominate only two songs annoys me, but I suppose it could be a true difference of opinion. I don’t think War Horse is one of the year’s best films, either. But what really kills me is that last year had the exact same nominating process and four songs received nominations. Last year’s list of qualified songs was really bland and the four nominated songs were totally unmemorable. I don’t know how anyone could look at that list of songs and see more quality choices than this year. Even if we disagree on which songs, there’s no way there are twice as many deserving songs last year compared to this year. I hope the outcry this year makes the Academy rethink the nomination process. 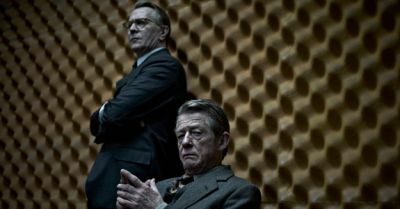 It’s hard to call many things locks when it comes to craft categories, but one of the surest to me was Maria Djurkovic for Best Art Direction in Tinker Tailor Soldier Spy. Here’s a film that is heavily steeped in its setting, particularly in the memorable building housing the MI6 spy service. Djurkovic swept through critics and precursor awards. Some precursors have catch-all technical awards, placing craft artists from different disciplines together in one category. Djurkovic wasn’t just nominated but she was winning, beating out the best costume designers and makeup artists. I just don’t get how she missed when it came to the Oscars!